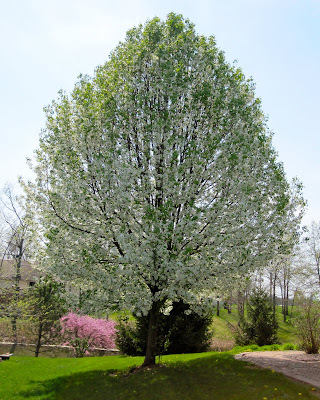 Cupcakes 'n Daisies: It's a Beautiful Day . . . . . .
blooms, green grass and sunshine abound......it's a beautiful thing!! and ended up with this!! 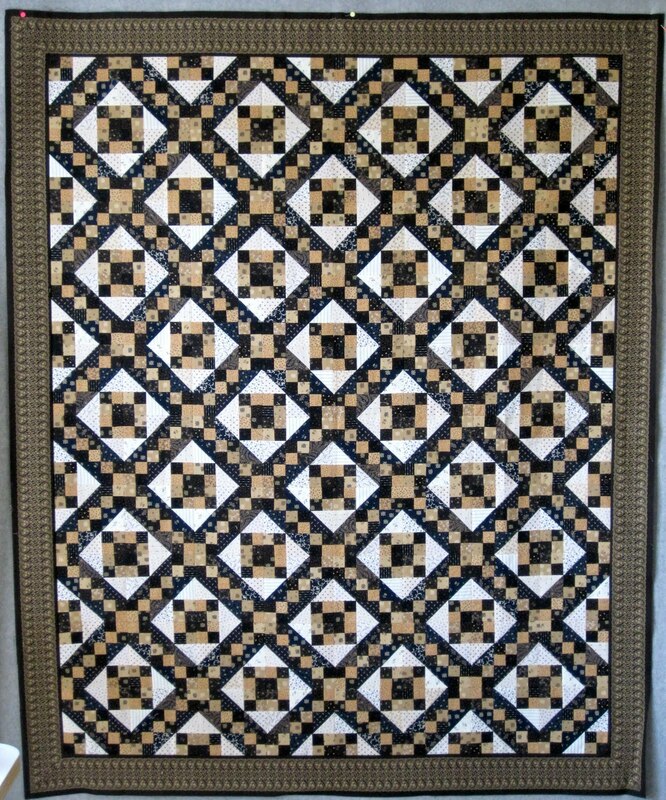 Jane at Too Good To Be Through left the following comment about Jake and it is such a good description of this quilt I thought I would share it again, "Dark denim meets Brooks Brothers Chinos meets crisp white shirts." Thanks so much for all the comments encouraging me to stick with this project. I liked it the whole time I worked on it, I just felt like it was sooooo sloooooow going. Like I was just getting nowhere. Adding to that feeling was the fact that I've just not been able to spend as much time in my sewing room as usual. Jake is quilt number 57, finished at 55" x 67" , is made up of 80 six inch blocks, and has 1,250 pieces. my first border with mitered corners. I received two really great tutorials that got me through the process. Call Me Crazy at Crazy 'bout Quilts suggested a tutorial by Jaybird Quilts. I also got a tutorial mailed to me from a friend. They both used the same method, which was a big help. One thing that I wasn't sure about, and was not addressed in my two tutorials, was how to get a design to match perfectly. I just figured if I cut each strip exactly the same, it would all work out. And it did!! The first two corners went together perfectly. I did the third corner the exact same way, but it just would not lay flat when pieced. I tried it 3 times and was just not happy. So I moved on to corner 4, it went together OK, but not as perfectly as corners 1 and 2, but good enough. I then went back and did corner 3 for a fourth time....I'm sure it will look fine when it's quilted, but it's not as perfect as I would like. Guess there's something to be said for beginners luck. I like the look of mitered corners, I think I will do this more often. The tutorial by Jaybird Quilts is for mitered multiple borders, that looks really sharp too. 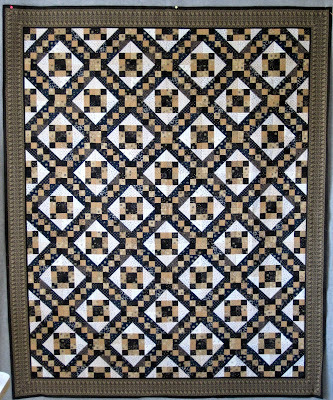 Don't forget, if you would like to make this quilt you can get the pattern, Climbing Jacob's Ladder II by River's Bend Quilts and a kit at The Quilt Merchant. Next up, Wild Goose Chase! Jake come out beautiful! I love the design and I love the fabrics you chose. The mitered corners? Just lovely. Not beginners luck at all but a talented quilter working through something new. You have skills! This quilt is stunning!! What a great description by Jane!! Looking forward to some wild geese! gorgeous!! The borders look fabulous! I think I need one for my own. OOOOO, I swooning with Love for Jake's quilt! LOVE it and the borders....well, you did fabulous! oh it is beautiful and great border choice. I think your corner is amazing! I couldn't quit looking at it. A very beautiful quilt. That is one of the most gorgeous quilts I've ever seen in my life. A color scheme I would never have chosen, but it fantastic. And those borders! Your miters are perfect. Wow. Wowwowwowwowwow! Oh it turned out great Thelma! Really lovely. Spring is starting to show up here which is making me happy. I need the colour. Jake turned out beautiful and what an excellent job you did with those mitered corners! Absolutely beautiful quilt. Great job on the corners and great description by Jane. You kept this close to the vest - I'm so proud of your finish. It looks absolutely amazing, and that border fabric is killer! What collection is that from? Your miters look perfect, and yes - every time I do one, I think I should do them more. They look especially good with your border fabric. Perfection! Jake is quite the dapper dude! Very handsome, indeed. I love your mitered border - way to go! Oh dear me, that is one heck of a quilt. Stunning. Oh. Wow. Jake is amazing!!! Your borders are stunning! You've inspired me to get going on a wisp I have which is similar! Thanks! you did an amazing job piecing this quilt together. Jacob's ladder block is on my list to try. love the fabric combo! Oh Thelma!~ Jake is wonderful! And way to go with the borders!! I always have one that doesn't behave as well as the rest too, but after 3 tries, it stays. LOL I love your border fabric too! Have a happy day! Gorgeous! You did a great job on those mitered borders. Congratulations on learning a new technique. Congratulations Thelma! It's wonderful! And what a perfect border fabric you have! Great job on the miters! I find mitering to be a technique that keeps me humble because there is no rhyme or reason to why it works sometimes and is a nightmare other times, when I am using the exact same process! Thelma< The quilt top is beautiful. Aren't you glad you went ahead and finished it. Now you can move on to the next project with a clear conscience and you gained a new skill. Touche! Thelma, love your picture of spring. You constantly amaze me with your quilting skills!!! This is another perfect and gorgeous quilt! I would not have guessed this is your first time making mitered borders. Can't wait for the next one. Thelma, Jake is positively awesome! Your mitered corners are incredible...the border is beautiful! WOW! Congratulations on the mitered border. The whole quilt looks gorgeous! And that's a great description. Absolutely stunning! This has to be one of the best quilts you've shown. Very inspiring. Oh, I'm so pleased for you, Thelma, you stuck with it! I'm considering mitered corners, too, not 100% yet, but yours sure motivate me to consider! Jake is very cool! Jake is handsome and then some. Your mitered corner is so perfect it looks manufactured! Great pattern made with great fabrics -- it has such a fresh look. The instant I posted my comment about denim-meets-chino-meets-crisp-white-shirts, I thought, "Oh heck, I hope that doesn't upset Thelma!" I was happy when you told me the description hit the spot with you, too. What a beautiful quilt. I'm so impressed with your mitered corners. I tried it once and they looked horrible. I'll have to give it a go again using the tutorial you suggested. You've inspired me! What a great quilt! I esp. love the border fabric, and you did a great job with the miters. I love everything about this quilt!!! You did an excellent job! ;) and those colors.... soooo elegant! Hi, I'm Leanne Hurley, author of Jacob's Ladder II and sell patterns under the name River Bend Quilts. Thank you so much for enjoying my pattern. I would be happy to sell the pattern over the internet. The Quilt Merchant has sold all of the kits and they don't have any more patterns. If you are out shopping in Illinois, the pattern is currently available at Prairie Shop Quilts in Batavia Il. To contact me: Leanne1947@comcast.net. I also have a few more patterns and will be designing a couple more over the summer. Love thequilting, who did it?